History gives us beautiful symmetries, sometimes. It’s so right that this quote comes not from some mature piece of Chaplin comedy, but from the film that marked the Tramp’s very first public appearance. Doesn’t it just sum him up? All twenty-two years of him, from these early, blunt Keystone days to the almost post-comic icon he became for United Artists. Always odd, always outside, and always there: drawing our eyes from the centre of life to the periphery. The Tramp never occupied less time on screen than he does here. Kid Auto Races is brief: just under seven minutes, with a plot equivalent to one gag in a later Chaplin short. The ‘odd character’ is a spectator at a go-kart race, more or less: kid drivers in motorless cars are pushed to the top of a steep wooden slide, then roll down it and along a winding track. The crowd swells at each turn and a local film crew (a Keystone crew, let’s say) positions its camera to catch the action. And time after time, their view is blocked by the Tramp. Is he a different Tramp from the one we know? Incomplete? ‘Primitive’? No. We have all the parts: the look of the man, with his ill-fitting suit, bowler hat and cane, and the rocking-chair walk. 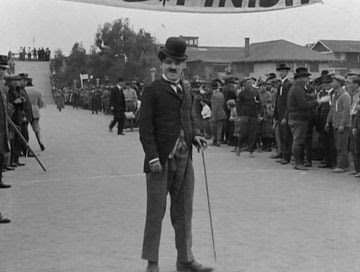 His persona is familiar too, at least if you know Chaplin’s work prior the First National days. He’s more aggressive, greedier, more physical and less sympathetic—more, I think, like most people perceive vagrants to be. The sweetheart Tramp of later years was a man we knew from the movies, not a man we’d ever meet on the street, where so few of us would’ve deigned to shake his hand. And he’s persistent. The Tramp, for reasons of his own in this film, wishes to be filmed, and with each rebuff he finds a new way dominate the frame. At first jogs ahead as the camera pans past him; then, when the crew responds more violently, he acts as though he’s been doing it by accident. Finally he reacts as though he’s been offended; but again, it’s all in front of the lens. I don’t know why the Tramp wants this so bad. Early versions of him are often cloudy this way. Yet Chaplin created a character so refined in his motion and so closely mimicking natural human reactions that it never matters. You might say Chaplin collapsed the barrier between motivation and action. While the Tramp obsesses for reasons we can’t understand, his means of attaining a goal always has logic, and his emotional response to success and failure make him credible, even normal. It sets the Tramp apart—most glaringly in these Keystone shorts—from actors playing caricatured types, who react in caricatured ways to things such types are supposed to react to. The Tramp’s not a Bum; he’s a man who has no home. Kid Auto Races isn’t much on its own, but it does do one interesting thing: it selectively breaks the fourth wall. It makes the camera Chaplin’s mugging in front of the same one we see him through. I liked the creativity of this, and the cheekiness—Kid Auto Races, like some other Keystone shorts I’ve seen, remind me a lot of the Warner Brothers cartoons that would come along twenty years later. Same snarky spirit; same immunity to convention. Those cartoon characters never aged of course, and it occurs to me that the Tramp never did, either. He certainly evolved, though not that much. And Chaplin obviously grew older. But Chaplin’s physical gifts remained, and the pancake makeup, mustache and hat still stuck, so there isn’t much to distinguish the Tramp in Kid Auto Races from the Tramp in Modern Times (1936). He’s eternal. Maybe he mellowed a little. But mostly, we mellowed to him. 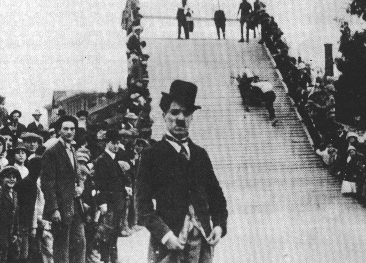 Kid Auto Races was Chaplin’s third film for Mack Sennett’s Keystone Studios, the first released in which he played the Tramp, but the second film in which he played him (Mabel’s Strange Predicament having been shot shortly before, but released later). Both films, and many others, are available on Flicker Alley’s fantastic four-disc set, Chaplin at Keystone. If you think Keystone films were all cops, bricks and pies, get ready for a major shock. 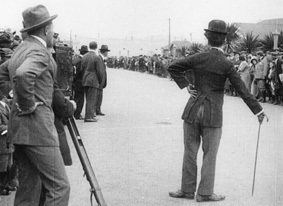 how did Chaplins role in Kid Auto Races at Venice influenced the films of the 1920's? Beats me. It probably encouraged Sennett to let Chaplin keep being The Tramp. And so on.